A meta description is text within your HTML code that is sometimes returned in the search engine results. It is a summary of what your page content is about and is typically about 160 characters. This little bit of text can affect your organic traffic results so it is important to write great meta descriptions that encourage users to click your result over your competitors. What does a meta description look like to searchers? What does a meta description look like to the search engine bots? Do I have to have a meta description? Will the search engines always use the meta description I write? Is there anything I can do if my preferred meta description is not being used? What NOT to do with your meta descriptions! In the image in the right you can see an example of meta descriptions and how they look in the search results. You can see that when search results are returned it is an important piece of real estate that lies below the title of your page and the URL. This is an area that should be carefully considered when writing your pages and posts to ensure you are doing a good job of engaging searchers and delivering a message that will make them WANT to click your search result over all others. Basically it is a line of code that is in your website – invisible to you, but the robots eat it up! Here is our own meta description for our home page. Simply stated – YES, YES and YES! If you are not writing meta descriptions you are losing out on a great opportunity to bring in new traffic from all the search engines. As a WordPress development company we think it is important to educate our clients on the importance of this – but we take special pride in knowing that we populate our clients site with meta descriptions prior to launching! This gives them a great start when they are ready to begin their SEO work. Every day there are searches being done for your service, product or blog topic. How do you stand out from the crowd? Your meta description may be one of the best opportunities you have to convert that searcher to a client, reader or supporter. It has pretty much been clarified by several sources that no, meta descriptions do not directly affect your website rank in the Google search results. It may have some affect in other search engines though so we do highly recommend always writing well optimized descriptions that include a keyword. But what it DOES do in every search engine is affect your click-thru-rate (CTR) which has been suggested to affect the “relevancy” of your website to certain keywords which may in fact help you in the search results. Basically — the more people who click on your search result and the longer they stay on your website – this may have an affect on your rank. Below we show an example of how sometimes Google will actually pull content from your page as opposed to the actual meta description you write – and yes it is annoying as all heck when they do this. 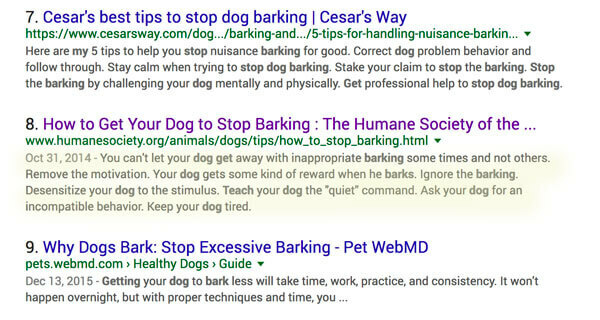 We did a search for “how to stop my dog from barking” – because well – we have a dog barking problem going on, so any tips let me know! One of the results was for the Humane Society and you can see their pulled meta description highlighted in yellow in the image below. But if you read it – it is a bit confusing right? Well there is a reason for that confusion in what their meta description says. This is the meta description as shown in their source code – the one that the website owner WANTS to use, but you can see that what is entered below is clearly different than what is being returned in the search results above. So, why was this one not used by Google? 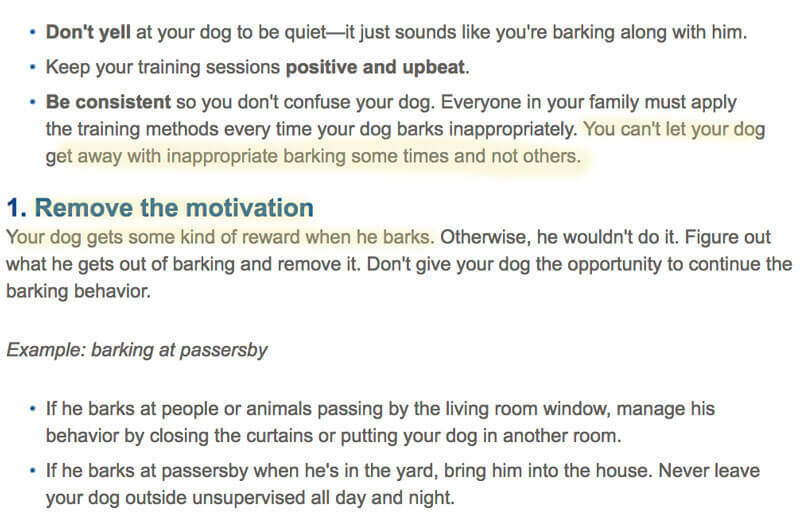 It has the keyword “stop your dog from barking” – it talks about the website content and appeals to me as a searcher. The ONLY thing we can possibly see as an issue is the fact that is is using 233 characters as opposed to a recommended 135-160 character limit. We do not know for sure of course, but it seems plausible – if this was our website we would change the meta description to be shorter and see if Google picks it up in the future. Here is a portion of what was actually pulled for the meta description – random text that if you read, kind of makes no sense without the rest of the content of the article. The meta description actually contains short text blocks from a few paragraphs in the post (we only show one small section below) – which is why it reads weird as a meta description. If Google is pulling a different meta description, then there is probably SOMETHING they feel isn’t properly representative of your actual page content. There are no definitive things you can do unfortunately – but you can try the following. Make sure the meta description you have written is not a duplicate for another page. Rewrite the meta description completely to be better aligned to your content. Make sure you do not have multiple meta descriptions being generated on your website. 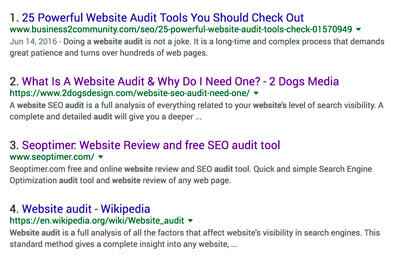 Sometimes multiple SEO related plugins can cause issues and duplicates. If your meta description is shorter than say 125 characters or longer than 170 – rewrite it to fit within the 135-160 character range and see if it gets pulled. There are a few words of caution we want to give you when writing meta descriptions to improve your click through rate and potential engagement by the searcher. NEVER stuff keywords in your meta description! NEVER EVER! This means do not use your keyword or a variation of it more than once. Do not use the same meta description on several pages. Do not write meta descriptions that have nothing to do with your page content. Only use alpha numeric characters – and NEVER use quotes. Keep the content to approximately 135-160 characters. There is no longer a true magic number since Google will choose to show as much or little as they would like, but this has been a good character number overall – and writing more than that can result in truncation or the possibility that Google may pull different text entirely. Include a call to action! Give them a REASON to come to your website. “Our I Love Dogs shirt is now available see it now if you love your dog!” or “Imagine spying on your competitors without them knowing. Try our software for free today.” These are just 2 examples that have a clear reason to visit the page. Matching the page content is critical. Make sure whatever your meta description says – emulates what your post is about. While some may say it is not relevant, we do recommend including your main keyword in your meta description. It may improve the chance Google will use your preferred meta description and Google also highlights relevant keywords improving the chance of being clicked on. Make it conversational! Imagine how you would tell a person about your page and work with that for your meta description. Meta descriptions that entertain, have a call to action and tell us clearly what the page is about are hard to write. But below are a few that we think do a great job and make us really want to click to learn more about the website! Use these as inspiration to generating your own fantastic meta descriptions. This dog blog did a great job writing a meta description for their post about litter boxes for dog. Starting with a question gets your curiosity up and then following up with how the product can help a certain demographic is a perfect way to get people to click to read more about the post. We would recommend they modify the title tag though since that is a bit lacking in engagement! Reaching out to users by showing they understand you are unique – and offer options for you at their restaurant is a great way to build a sense of “understanding” of their consumers. They also managed to squeeze in a recommendation to sign up for offers! We did a double take on this one because it did not seem real at first, but it is and it is funny as all heck. Do not be afraid to be funny! It reaches out to you by asking a question first – then clearly defines everything they do to help you plan your travel. It is personal. descriptive and perfectly fits the recommended character amount. This is a great example for a specific blog post about raising teenagers. It appeals to me as the mom of a teenager in wanting to see her experiences, it is witty and sarcastic (of course not everyone responds to sarcasm it works here because her blog is sarcasm based) – and she shares her credentials too. Right off the bat we see the Free Shipping deal and know that they have vintage pieces for all occasions – so they are clearly showing searchers what they offer and how they can get free shipping which is a great call to action. This is a great example for a nonprofit. They first ask about me and what I want – then tell me how they are going to help me and even recommend what I should read first. Just a great use of space! Keep your meta descriptions under 160 characters to prevent it from cutting off. Power words work – “special offer”, “transform”, “improve” – words that get people excited! Clear call to action – what do you want the searcher to do? Call you, click the link etc. Note any special offers or deals – let them know what incentives you have for them. Talk to the searcher – solve their problem if they are searching for a how to, give them reasons to pick your product. Before you post -TEST! Make sure it looks good and sounds good. Another highly recommended thing to do is A/B Testing. We have just started working with A/B Rankings and are very happy with their platform so far. We have only been using it to test our Title Tags so far but are going to start working with it on our meta descriptions as well. You can get a 14 day free trial to test it out here. Thanks for the advice from your post. I have a trophy sales site so my products are quite similar ie football trophies. I am running out of ideas to make them sound different and I have 3000 items so its slow. Can I copy and paste the metadescription then change some words to make it relevant to the item I am applying it to or would this be detrimental to the site? I’m trying to get my site working a well as I can with no training. Hey Jerry! E-commerce is harder and more time consuming! But you should still try to make them a bit unique. I just took a quick peak and see a lot of different styles for the football collection. So your description for one may be something like “Celebrate that football win this season with a football trophy featuring a gorgeous shield that encases a bronze embossed football.” or “it is all about the football gear with this unique football trophy that features a classically styled football boot and ball to showcase how the winner has mastered their skills!” I know it is hard and very time consuming but it will be worth it in the end! According to me, meta description should be less than 923 pixels. Great tool you have there! I am using WordPress site representing MEP company, with many meta descriptions defined in each posts (e.g: for each image and slider etc too). My question here is that whether all these meta descriptions will appear for each post or random selection? Is this a good practice to define many meta description of post? Hi Shabbir – my understanding for the Meta Descriptions for images (probably sliders too) – is that the meta description will show if the image is reached as a post in itself. Since we do not have our images showing as their own post we do not use that feature at all. This would be a setting under the Yoast SEO Media tab where you can “redirect attachment to URL” – we always set that to no. Hope this helps! We are not aware of any because we do not use them and would not recommend them. A meta description should be handcrafted — using a generator will not give you the results you want. In your descriptions, it shows regular typing as in what I’m doing here, but from my other research you’re to not use spaces and to use the _ in between words. Like try_my_coats_if_your_are_looking_to_buy_new_coats_come_toURL.com Or something like that is this true? plus to not use capitol letters and if you don’t use the _ at least use a , but no space in between the next word. I am not sure what you are referring to here? This post is about meta descriptions — you would absolutely use capital letters and proper grammar in a meta description, not underscores.